“I choose to study FdSc Veterinary Nursing as it has always been my lifelong ambition to become a veterinary nurse. I choose to study at NTU due to the proximity to my home but, regardless of this, I would still have chosen NTU based on its facilities. I think the animal unit and veterinary nursing buildings are amazing. Having access to multiple animal species enhances the learning experience at NTU. 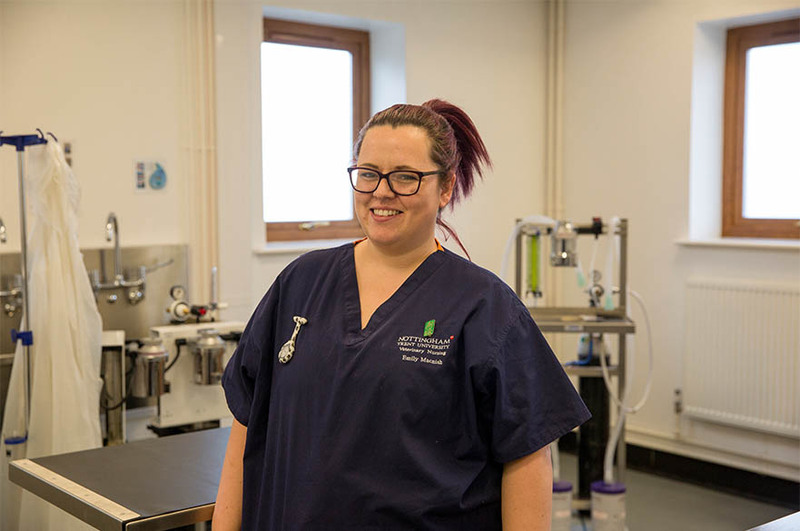 “During the first year the course covers modules such as essential veterinary nursing skills, anatomy, and practice administration and communication skills. During the course we have to complete a set amount of placement hours and complete our nursing progress log. The lecturers at NTU guide and teach us all we need to be ready for these placement hours and are fully supportive. “The veterinary nursing team are truly incredible. They have unlimited time for each individual student and will help and direct you to help for any situation you find yourself in. They are all very creative and make lectures and practicals fun. They’re all light-hearted and you can have a laugh with them so long as you keep your work up. “I particularly enjoy the anatomy module. In particular I enjoy the dissection lessons as they help you to fully understand and visualise what is happening within the animal's body. I also find it very interesting to learn how different systems work within the body as it is relatable to both patients and my own body. “To enrol on this course, I believe you have to be 100% sure that veterinary nursing is your dream. This course is hard work, but it is truly amazing and fun. Try to get as much experience as you can before you come to university, it will help incredibly in the first few weeks at NTU. “Usually the first placement for vet nurses is in March/April in the first year. However, I went into placement over the Christmas period. I found it truly amazing and helped to put into perspective everything that I had learnt so far in university.